I was pleased to participate in the Peace Corps Connect conference held in Boston on June 28-29. 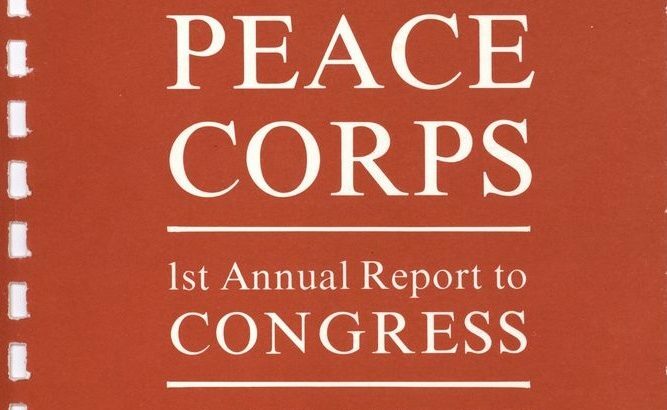 This event was the second annual gathering of the National Peace Corps Association. Because President Kennedy established the Peace Corps in 1961, the Kennedy Library has several archival collections pertaining to the agency and its work. 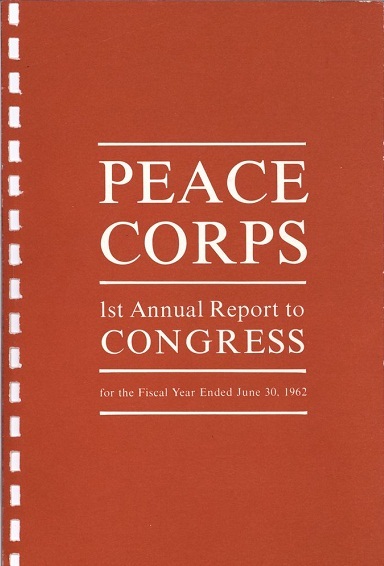 Our largest collection is the Returned Peace Corps Volunteer Collection, which contains original documents and archival materials created or received by volunteers during their official tours of duty, with an emphasis on the period of the Kennedy Administration. I am a processing archivist who has worked on the RPCV Collection for several years now, so I was glad to accept an invitation to speak at the conference and to meet some of these extraordinary volunteers in person. My co-presenter for the workshop was Susan McElrath, the university archivist at American University, home of the newly-launched Peace Corps Community Archive. Our session was titled “Archiving Your Peace Corps History.” We discussed how RPCVs can develop a personal collection of items documenting their Peace Corps service; provided tips for preserving and storing these materials; talked about the process of donating personal materials to an archival repository; and reviewed the collecting scopes of each of our respective Peace Corps collections. Some of following information may be of interest to our readers and to other potential donors of personal archives. What should a personal Peace Corps archive contain? When gathering your important documents, consider what journalists call the “Five Ws”: who, what, where, when, and why. Documents that answer these questions will form the foundation of your collection. Prioritize primary-source material, that is, material that is directly relevant to your own personal work and experiences. Primary-source material is the most informative because it provides a first-hand account of your service. Usually these are items you created yourself – such as letters you wrote or pictures you took – but sometimes they can also be items you used extensively, such as project manuals, or items created by other volunteers, such as a local Peace Corps newsletter. Consider whether you have any correspondence, diaries, training syllabi, rosters, directories, reports, plans, scrapbooks, slides, or videos from your service. Sorting and labeling your materials will allow you to gain control over the collection. Start by grouping similar types of materials together. For example, it is helpful to have all of your correspondence together in chronological or alphabetical order. Once you have organized your materials, place them in folders and label the folders with titles and date ranges, such as “Letters from home, 1961-1963.” Create an inventory of your collection by typing up a simple list of folder titles. You can also provide supplemental information if the context of certain items might not be clear to others. Photographs, especially, can benefit from adding a caption that describes the event and date and lists the names of people pictured. The key to making sure your collection lasts as long as possible is a neutral storage environment. There are several things you can do to protect your materials. Try to keep the temperature and humidity as stable as possible because major fluctuations will cause items to deteriorate more quickly. Ideal conditions are a temperature between 68-70 degrees and relative humidity between 40-45 percent, but these benchmarks can be very difficult to achieve. The most important thing is to avoid storing your materials in the attic or the basement, where temperature/humidity fluctuations tend to be greatest. Always store your boxes on shelves instead of on the floor to prevent water damage from floods or leaks. Light and dust are also damaging, so materials should be stored in folders or boxes. Use archival-quality supplies if you can afford them. Look for boxes and folders that are acid-free. To store photographs, look for products that have passed the Photographic Activity Test (PAT), which checks for chemicals that react with photos. JFKWHP-KN-C18661. 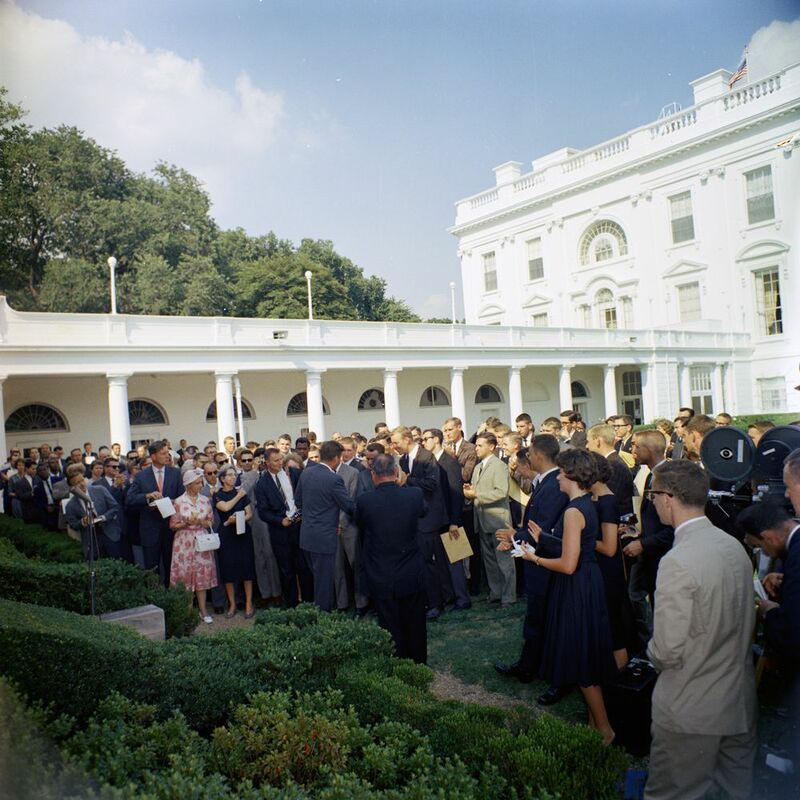 President Kennedy greets first Peace Corps volunteers in the Rose Garden, 28 August 1961. Exercise caution when handling fragile materials. The principle to keep in mind is “first, do no harm.” Avoid making non-reversible changes to your documents. For example, do not repair tears with Scotch tape. If you have to write on an item, use pencil, not pen. Instead of writing directly on the document, consider making notes on a separate piece of paper and file it in the same location. If you notice that rusty staples or paperclips are staining paper items, carefully remove them. To ensure long-term access to digital files, make multiple copies and store them on a variety of media. For example, put one copy on a CD and also back one up on a removable hard drive. Since file formats change frequently, plan to transfer your files before they become outdated and unreadable. Using common formats such as PDF for text documents and MP3 or WAV for audio files will aid long-term readability. Caring for your personal collection is rewarding but it can also be quite labor-intensive. Consider your audience and your goals for maintaining this material; do you want to share your story with your immediate family or with the entire world? Donating your items to an archival repository will make them publicly accessible to researchers seeking to understand the importance of the Peace Corps through history. You have many choices when determining where to donate your materials: a local historical society in your home town, the archives of your alma mater, or a repository that specifically collects Peace Corps materials. One benefit of donating your collection to an archive that has other Peace Corps collections is that it is already a destination for researchers, which will improve the likelihood of your materials being used on a regular basis. If you wish to donate your material to an archival repository, first make a list of exactly what you want to send. Submit this information to the archivist with your contact information including country and dates of service. Please do not mail your material before contacting the staff with your donation inquiry; unsolicited donations may be returned. Once your donation is accepted, there is some paperwork to complete. Most archives require that you sign a deed of gift agreement to legally formalize the transfer of ownership. Executing a deed is in the best interests of both the donor and the repository, as it establishes the relationship between the two parties and documents the legal status of the materials. It also provides rules for the administration and use of the collection, and documents ownership of intellectual property rights; the Kennedy Library’s strong preference is for donors to transfer all intellectual property rights (copyright) that they hold in the materials, to the United States, making them pubic domain (PD). Once your materials are accessioned into the archives, they will be available for research. If your collection contains sensitive information that should not be made public, be sure to mention this to the archivist during the donation process. Most archives routinely screen incoming materials for privacy concerns, such as personal medical or financial information, but it is very helpful if the donor points out specific issues in their papers. Access restrictions can also be specified in your deed of gift, though we encourage donors to open as much material as they possibly can; reviewing archivists will close any materials that infringe on the privacy rights of other individuals. The Returned Peace Corps Volunteer Collection at the Kennedy Library collects original documents and archival materials created or received by volunteers during their official tours of duty. Our current collecting policy focuses on the period from 1961 to 1963, the years of the Kennedy Administration. Donations of material created after 1963 may also be considered but are subject to the approval of the Director and Chief Archivist on a case-by-case basis. For more information, please review our donation policies. JFKPOF-086-003-p0021. 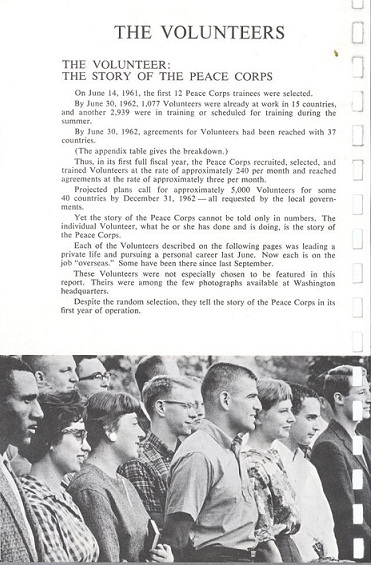 First Group of Peace Corps Volunteers, First Annual Report to Congress, 1962. The Kennedy Library is also home to the Returned Peace Corps Volunteer Archival Project, an oral history initiative. Spearheaded by the late Bob Klein (RPCV Ghana I, 1961-1963), the project began recording oral history interviews with returned volunteers in the late 1990s. Since then, nearly 500 interviews have been completed and added to the collection. The scope of the oral history project is is not limited to the years of the Kennedy Administration. We are very grateful to Bob, and now to Phyllis Noble (RPCV Nigeria, 1965-1967), for their extraordinary efforts in building this marvelous collection. The Peace Corps Community Archive at American University collects, exhibits, and provides educational and public programs that document the experiences and impact of individuals who served in the Peace Corps, and that of individuals and institutions in host countries. There are no limitations on format, date of service, or country. The institution also collects the organizational records of National Peace Corp Association member groups. For more information, please review the donation policies for the collection.